Yesterday I wrote a blog post on my surprising finding that Jetty was able to out-perform, or at minimum keep up (depending on how you looked at the numbers), Nginx when it comes to static files. Today I wanted to get it up and running and able to serve Magento requests. It turns out that it is stupid easy. That said, it was stupid hard figuring out how stupid easy it was. So let’s look at number 3. There are two things you need to know about this. First of all is that FastCGI is not enabled by default. You need to add it to its start.d directory. FastCGI is now installed. Now you need to configure a default context. Create a file called $JETTY_HOME/etc/webapps/fcgi.xml (or whatever.xml) and add the following. Find org.eclipse.jetty.fcgi.server.proxy.TryFilesFilter. That is the equivalent of Nginx’s try_files setting. Here, if it doesn’t find the file, route it to index.php. The last addServlet item is the FastCGI component. I trust you can see the two important settings. And there you have it. A Jetty instance configured to run Magento. 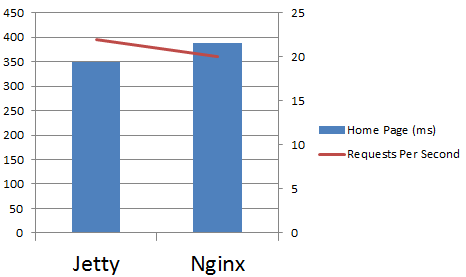 Oh, and how does this compare to Nginx in terms of Magento throughput?